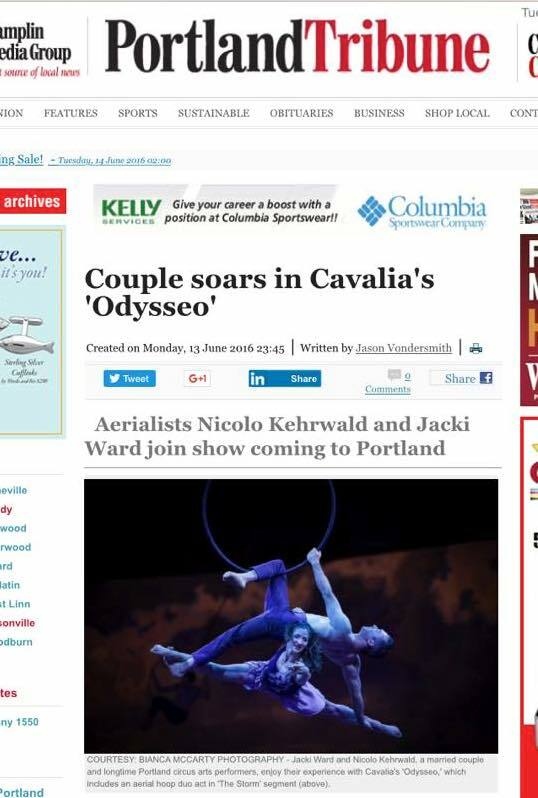 After a couple weeks of training and rehearsals, we are proud to say that we have officially premiered with Cavalia’s Odysseo. Our next stop is Salt Lake City – find tickets here! 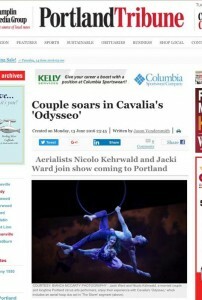 Smiling after our premiere with Cavalia’s Odysseo! We are having a wonderful time onboard the AIDAsol! It’s a delight to perform in shows with such high production value, and with such a talented cast. We put together a short demo video with footage from our various acts on the ship. Hope you enjoy! Our recent creation with the Acrobatic Conundrum, “The Language of Chance,” received a glowing review from the Huffington Post. The Language of Chance preview from terry crane on Vimeo. The show is running in Seattle through February 8th, then we will be taking it on the road for a West Coast tour in March and April! Stay tuned for more dates. Happy holidays, folks! We’ve had a busy season here, as usual around this time of the year. 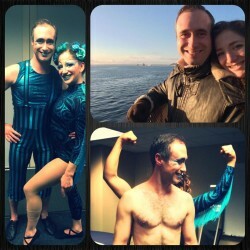 In early November, we performed both as a duo and with the Acrobatic Conundrum at the first ever Vancouver CircusFest, which was a wonderful experience! We hope to be able to return in the future! We had a big project Thanksgiving weekend, wherein the Acrobatic Conundrum’s show, A Book is not a Ladder, came to Portland and was presented by the Circus Project! 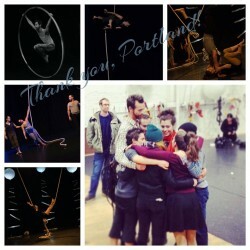 It was a wonderful melding of our communities – the Circus Project is where we coach and train here in Portland, the Acrobatic Conundrum is our ensemble, contempoary circus adventure, and we performed at the Echo theater, which is where we both got started training in the circus arts decades ago! Since then, we’ve been grateful to have some down-timefrom performing, wherein we’ve been updating our straps act and continuing to train for the next level of skills. We’ve had a smattering of wonderful holiday gigs with Animate Objects Physical Theater - next up is a flashy New Year’s Eve event at a casino! Stay tuned for news about our West Coast Tour with the Acrobatic Conundrum! Until then, have a restful and joyful holiday season! We are so looking forward to performing at the upcoming CircusFest in Vancouver, B.C. November 6-9. We will be performing our duo straps act in the late-night cabaret as well as performing our new full-length show, A Book is not a Ladder with the Acrobatic Conundrum! Passes to the festival are on sale now! We have been so excited to work with the Acrobatic Conundrum this summer for a new contemporary circus creation, entitled “A book is not a cover,” inspired by the Library of Babel by Jorge Luis Borges. We have the honor of working with renown choreographer KT Niehoff on this piece, and are fully enjoying the opportunity to explore the intersections of contemporary dance and acrobatics. 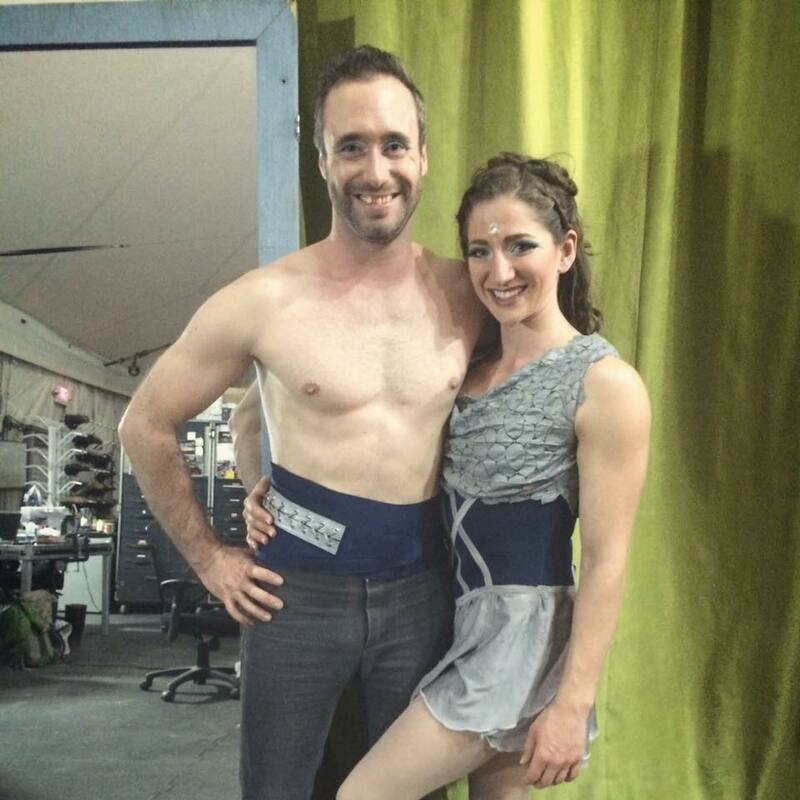 Interested in supporting contemporary circus in the States? We are running an Indiegogo campaign to help us take the show to New York, and we would be so very grateful for your support!